Count on these little guys to stand by your side. They've got the swords and sorcery down, but a dose of fire will melt their courage. These little guys stand by their comrades. They've got the swords and sorcery down, but a dose of fire will melt their courage. The Sir Kyroo is a Dream Eater that appears in Kingdom Hearts 3D: Dream Drop Distance. 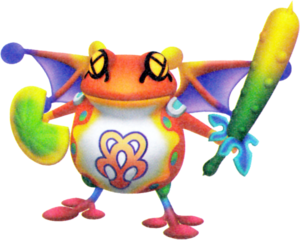 The Sir Kyroo is a winged frog armed with a cattail blade and a lilypad shield. Both the English and Japanese names contain a variation of the Japanese word for "frog," kaeru (蛙?). Both "sir" and "soldier" refer to its weapons of choice, which are reminiscent of those used by medieval knights. As a Spirit, the Sir Kyroo's body is primarily orange, with a big round white spot on its belly. The Spirit Dream Eater symbol is located on the middle of his belly. Around the white spot, are little green and turquoise dots. The Sir Kyroo's legs are green, blending to blue, and has burgundy toes. It has a green and yellow cattail blade, with a blue hilt, and a chartreuse lily pad shield. Its wings are yellow, bending down to orange, with purple insides, and a purple orb on each end. It has yellow eyes, with its pupils resembling a "y". As a Spirit, the Sir Kyroo's body is primarily black, with a big round white and teal spot on its belly. 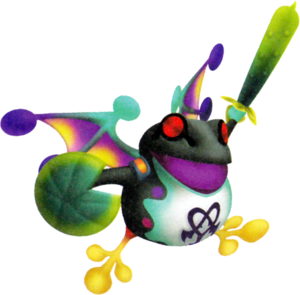 The Nightmare Dream Eater symbol is located on the middle of his belly. Around the white and teal spot, are little pink and purple dots. The Sir Kyroo's legs are orange, blending to yellow. It has a green and dark green cattail blade, with a yellow hilt, and a dark green lily pad shield, with yellow edges. Its wings are turquoise, bending down to a dark purple color, with purple and yellow insides, and a purple orb on each end. It has circular red diamond like eyes. ↑ 1.0 1.1 Becomes available when in Warrior disposition. ↑ 2.0 2.1 Becomes available when in Paladin disposition. Riku can obtain the Sir Kyroo Recipe from a chest at the Gullet. The Sir Kyroo can be created through six different recipes. The fourth recipe is a rank C recipe that has a 60% chance of success. The sixth recipe is a rank A recipe. This page was last edited on 31 March 2019, at 11:12.